I've said before that I am not a gamer, right? Because I'm really not. I typically hate playing games. They either bore me, I don't understand how to play, or I perpetually lose at them so what's the point? So why, why, why did God have me marry into a family that loved games? I've felt DOOMED for the longest time. Then Jonathan begged me to play Carcassone (see his review by clicking on the link) and I thought that was kind of fun. Then we played Bohnanza and I liked that. 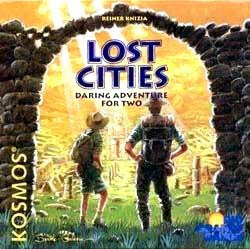 So when we had the opportunity to play Lost Cities I was more willing than I was a few months back. I am happy to report that I like Lost Cities also. The instructions indicate that each game can take anywhere from 20-40 minutes to play. I think that's true when you are first learning how to play the game and it is supposing that you play 3-4 rounds. However, we quickly got the hang of it and since the game plays in such a way as to give you an option to play 1 round or 3, it plays fairly quickly. We timed each round at about 7-8 minutes. That makes this a great game to sit down and play when you have a few spare moments (after tucking your 2 year old into bed at night!) or to sit down with for 1/2 an hour or so to just enjoy. It's a play-at-your-own-pace and with your own time frame in mind kinda game. That is incredibly appealing to us. We both agreed that this was a GREAT game for two players. It's quick. It's faced paced. (It's even affordable. Check it out on Amazon. It's easy to understand. And did I mention that I won the first round? Just wanted to make sure that you were paying attention. Yes, Katrina is the gaming expert. I DO love a quick game that is good for two players, because my husband is like you -- he doesn't like to play games (but unlike you, he doesn't often consent). However, Amanda usually will and she's old enough to play grown-up games for the most part now. In a few years when Bookworm1 is into games, GameWright card games are excellent.